An adorable California leaf nosed bat. Photo by United States National Park Service, via Wikimedia Commons. Hi everyone! Happy Bat Appreciation Month! I hope you all had a good week! People who were in Las Vegas last weekend had a very bad week. I would like to dedicate this week’s blog to everyone affected by what happened there. My thoughts are with you, your families, and your friends. This week, we will learn about a bat that lives in the Las Vegas area. The California leaf-nosed bat is adorable! It has huge ears, which makes its hearing spectacular. It can even hear the footsteps of a cricket! This is very useful for them because they love to eat crickets. They also eat grasshoppers, katydids, June beetles, diving beetles, and some moths. They have a cute leaf shaped nose that points up. This is where they get the name “leaf-nosed”. They have gray to dark brown fur. These bats have short wings, which makes it hard for them to fly long distances. They don’t migrate, but they don’t hibernate either. They do like to roost in caves and mines. Another interesting fact about the California leaf-nosed bat is that they are unable to crawl on their thumbs like other bats. 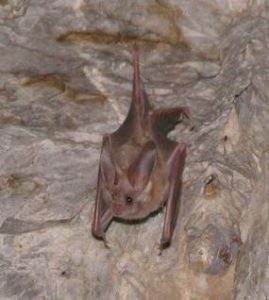 If you would like to read more about the California leaf-nosed bat, you can read about them here. I would like to wish everyone in the path of Tropical Storm (soon to be hurricane) Nate the best of luck! The storm has already hit several countries in Central America and it has been terrible for them there. My thoughts are with you all. I would also like to let the people of Puerto Rico know that they have not been forgotten. The island is still without electricity and drinking water. I hope life for people there is restored to normal soon. Previous StoryDo robots dream of electric bats?